EARTH DAY WORKSHOP – next Monday! The beautiful Rio Grande, one of the most beautiful rivers on earth. April 22nd is Earth Day, a day to celebrate and show LOVE to our beloved planet. This year the theme is ‘PROTECT OUR SPECIES.’ Many of our Reiki people have shown a great interest in participating in Reiki Healing on the Earth and it is important to us as well. In this experiential workshop we will be talking about and DOING healings on the Earth and it’s species and how we can best serve our planet. It is really US, the humans, who need the healing, but by focusing all our attention as a group on healing specific parts of the earth or specific species, we in turn heal ourselves and others who choose it as well. The snowball effect for these community healings is HUGE and has a great effect on all of us. It helps us to be more in tune with our planet and the animals as well as get intuitions of how we can help more in our daily lives. The whales need healing now more than ever. We will bring in our Reiki Healing Energy, meditate so we are all on the same level of resonance, and do two healings on the Earth and its species. We can choose what we want to heal and usually Mother Earth provides something timely for us to focus our attention on. Then we will also do a healing specifically on a species that is dear to our hearts and speaks to us for the second healing. The group energy will make this event extremely powerful for us and Mother Earth. Get ready, it’s going to be EXCELLENT!! All Reiki levels are welcome. 3 hours, $50 April 22nd, 5:30pm to 8:30pm Follow this link to sign up for this awesome workshop! New Reiki Healing Room Added-It’s AMAZING!! We now have two healing rooms ready, willing and able to hold space for your healing process. 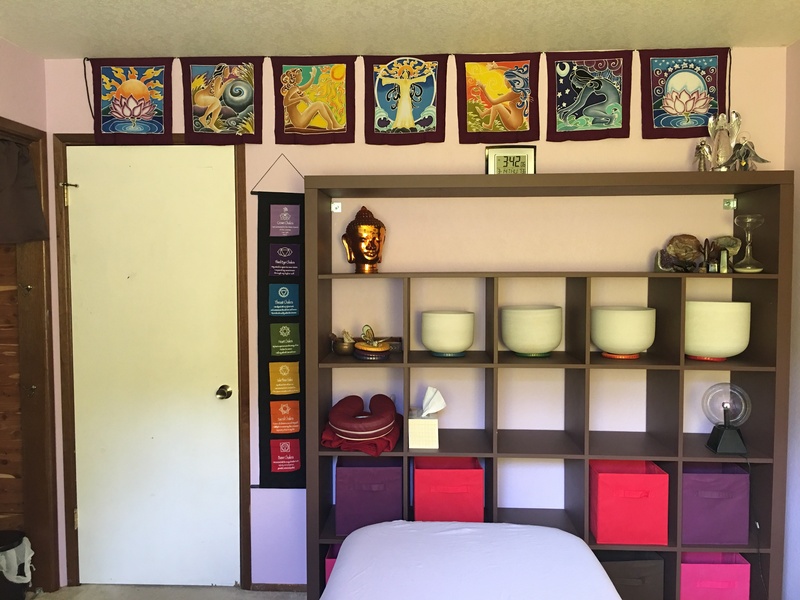 We have three Reiki Master/Teachers, one teaching room, four Reiki Master healers on staff plus a couple more who come when needed for specialty work like; Human Design, Astrology readings, QRI laser healing, Color Puncture and more. At Rain Shadow Reiki Energy Healing Center we’ve been painting, swatching, shopping (Lots of shopping!!) and much more to get our new healing room ready for …………well…………HEALING!! This has been a team effort and it has turned out more beautiful than we could have imagined. It started with Feng Shui. I know a tad bit about Feng Shui, just enough to be dangerous. I knew this room was in our FAME center in the Baqua of the building so I googled FAME CENTER colors and it came up with; orange, red, purple, hot pink, bright yellow, brown and wood for the element. The Fame Center is all about our good name in the community and we want a good name. OMG, HOW AM I GOING TO TURN THOSE COLORS INTO A CALM HEALING SPACE? Well, we did. I had a vision and we did it. I’m not a decorator or even good with this kind of stuff, but I know what I like, and I have a lot of help. Some of my students came to paint the room while I was on vacation so it was ready to surprise me when I got home. THAT WAS AWESOME! Just like Reiki works, every time we needed something, there was someone there who knew how to do it and volunteered. Much of the time this person was our new office manager, Bren. She’s an amazing DIY’er. Grateful for that and her!! Along with our vision came with a desire to have a really great painting to showcase the room. We called another one of our clients’ and asked if her husband would be willing to talk to us about the commission. He did and long story short, the painting is beautiful, more beautiful than we could have imagined it to be. He captured our idea and went further with it. We told him that our vision for this room was women all stepping into their light together and raising each other up with that process. Walking side by side in that process and sharing their light. Dwayne sat with Divine and received a vision of his own, then painted it. I have always been very in awe of people who can do that. Art is not my creative talent. But, it is his. Thank you Dwayne Northup. So, onto the photos, but most of all, I just want to say a BIG HUGE THANK YOU FOR EVERYONE WHO HAS HELPED INT HIS PROCESS, I COULDN’T DO IT WITHOUT YOUR MANY HANDS. GRATEFUL FOR YOU ALL!! P.S. Call or email us at 360-460-7829 or rainshadowreiki@gmail.com IF you would like a spirit guide reading, past life reading, Reiki Psychic healing for any issue or process, Reiki Healing, PEMF machine sound healing and much much more. See our website for all we offer.